This new arrival 613 clip-in hair extensions come with 7 pieces in a set for full head, there are totally 7 pieces of extensions in one set that contain 16 clips. Those clip-in hair extensions are very easy to attach and remove, the #613 straight model could be curled and dyed, because the usage of real human hair, the extensions feel soft, silky and very comfortable to wear. There are 14, 16 and 18 inches options for this #613 clip in extensions, each piece of clip-in hair extensions in a set has different width, so they are more flexible for women to attach. 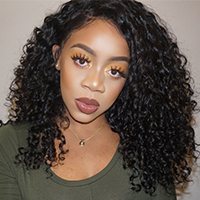 gorgeous hair Review by Jessica M.
Love the hair, looks very natural and matches in top quality. Thank you Leon.